After months of anticipation the time has finally come. The world’s first ever urban couture clothing line, Kindom Couture has officially launched and is currently fulfilling orders. Bay Area rap artist, Bobo Norco, took the world by storm in 2014 with two international hit radio singles, 1.6 million YouTube views, a performance at South by Southwest, and set an independent artist record by being on the cover of ten magazines in just six months. One of the things fans have admired most was Norco’s unique and exclusive style of clothing. His Instagram followers have marveled at his trendy wardrobe, exclusive accessories, and his $250,000 shoe collection which has its own bedroom in his seven bedroom NorCal residence. While he was playing in the celebrity flag football game at the 2015 Super Bowl, Norco was approached with an offer of starting his own fashion line. Norco agreed to be the spokesperson and creative director of the first ever urban couture which he called Kindom Couture dba KNDM. 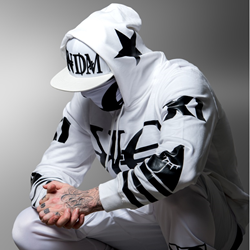 KNDM offers high quality joggers, jerseys, hoodies, hats, and much more for people looking for top-of-the line clothing made from exclusive, top-quality fabrics all while guaranteeing to be the most comfortable clothing you have ever owned.